We were up early for breakfast and our pick up to go to the airport, along with another family who were leaving at the same time. Once we had piled into the mini bus, all of the women were presented with fresh flowers as a gift for from our tour operators Kuoni. Our first week in Sri Lanka had gone so quick and I had loved every second of it, I'm not sure I could choose a favourite bit! After such a busy week we were definitely ready to relax and do nothing! The mini bus was a bit quicker at getting to the airport where we were then able to check in for our flight. Graham asked for seats as close to the front of the plane as possible as we had noticed on the way that they had a lot more legroom. After some time in the airport to look around the few shops, we were able to wait beside the gate for our flight to board. The flight we were getting was the one which carried on to London Heathrow after the stop in Male, which is the capital of the Maldives. The flight was fairly quiet as there were only a few going to Male and a few going all the way. Most of the passengers would be getting on in Male for the flight direct to Heathrow, as we would have done ourselves the next week, if everything had gone to plan! When we boarded we did have fantastic seats and we said we would definitely ask for those again on our next flight, again little did we know! It was only a short hour to Male and I loved flying over all of the islands on the way there. The airport in Male is on its own island and water surrounded the runway when we landed. It wasn't great weather when we arrived, a bit dark & grey but thankfully still warm! The time zone in the Maldives is 5 hours ahead of GMT, which meant it was 4 hours ahead during British Summer Time, just half an hour difference from Sri Lanka. After going through immigration and picking up our cases, we made our way to the Kuoni reps to collect information then joined the small group waiting to go to Coco Palm Bodu Hithi. We were all taken to the speedboat ready for our 40 minute transfer to the resort. After a fairly bumpy ride, we arrived at Bodu Hithi and were greeted by the staff at the jetty and taken to the open air reception. We were served ginger iced tea while we completed the check in. We had all been present with welcome and information packs, including information on our food credit, honeymoon meal & couple spa, all of which were included. As you can imagine, the majority of the guests were also honeymooners! The first thing we were told was that the resort time was different to the time in Male. The resort used daylight saving, which meant we were back to 5 hours ahead of the UK. There were various things to fill in as well and as we did this and looked at the island map, we noticed that we had been given the room number of a Water Villa. Although that was what we had paid for, for the time we were staying Kuoni had an offer for an upgrade to an Escape Water Villa, which is what we were originally going to book. I dug out our Kuoni ticket booklet & confirmation stating that our upgrade had been confirmed by the resort and gave it to them. After disappearing for a while the receptionist came back with another set of information and told us it had all been sorted out and that we should wait for the next golf buggy to take us to our villa. Of course, not everyone gets use of the golf buggies! 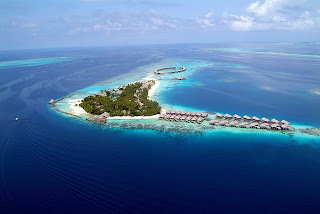 When we looked at the island map again, we realised that we had actually been given an Escape Water Residence, which was an extra upgrade to the best water villa's at the resort, which they now call a Club Villa. We assumed that since everyone had probably taken advantage of the same offer, all of the Escape Villa's were full and our original upgrade had been missed! Of course we were not complaining about getting an extra upgrade! We didn't get any upgrades (well, we were given a very nice room in the B&B) but gosh - I wouldn't mind this upgrade! How wonderful... the golf buggies run on these little planks - I'd be so scared of falling off! How deep was that water? Wow that sounds like an amazing trip! Congratulations! Gaynor, this looks utterly amazing! I would find the time zone thing very confusing, so many changes!